As the only national, non-profit, independent standards and certification body recognized by the Centers for Medicare and Medicaid Services (CMS) for the quality of life, activities and engagement certifications, NCCAP helps families and care partners who care for individuals aging in place at home by offering the first national Home Care Certification. A Home Care Certified (HCC) care partner has met NCCAP standards to provide engagement programs based on the below criteria. The educational requirement of a Home Care Certification establishes a baseline of knowledge for the care partner. With improved knowledge and skill sets, their jobs as care partners and personal care aides can become less stressful and more enjoyable, thereby increasing the quality of the work atmosphere and satisfaction in their position. This can lead to increased employee retention rates, stability in your workforce and reduced administrative costs for hiring and recruitment. The educational requirement of Home Care Certification establishes a baseline of knowledge for care partners. The increased knowledge and skill sets offer a Home Care Certified care partner the opportunity to improve the daily quality of life of a client while potentially decreasing the incidents for accidents and dangerous situations that could require a client to relocate from home to a long term care facility. By properly engaging a client in discussions or activities, the care partner could prevent boredom and depression that may lead to a dangerous behavioral outburst or aimless wandering with increased risk of falling or hurting oneself. 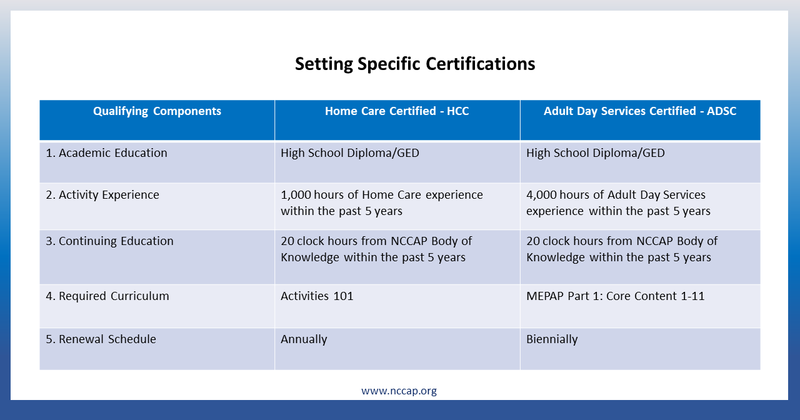 Many Home Care Certification components were developed using the criteria and standards for training and educational requirements for long-term care communities. Thus, Home Care Certified care partners can help ensure continuity of care and approach as a person eventually moves to institutional care. The documentation and background information Home Care Certified care partners are taught to gather can also reduce paperwork and intake costs for long-term care communities while providing needed information to make a senior feel comfortable in a new home. The cost of caring for individual aging or rehabbing in place is significantly less than the cost for aging or rehabbing in a Skilled Nursing Facility. A Home Care Certified care partner has the educational foundation to communicate and engage those who are aging in place. Proper communication is a prevention tool that the care partner can use to identify issues affecting the individual. This can lead to a reduction in accidents, incidents and behavioral challenges that may require medical attention. A Home Care Certified care partner provides peace of mind to families that their care partner has met the rigorous educational standards to become NCCAP Certified. This offers families and their loved one the opportunity for a higher quality of life through engagement and better caregiving. A Home Care Certified care partner can offer insights regarding how to communicate, engage and intervene with someone living with dementia. Home Care Certified care partners can also work with families to ensure continuity of approach and care for other individuals who interact with the family member.